The book is only $149.95 and includes both standard and premium brands. This interactive internet based product has always up-to-date information. The MyPartsHelp (MPH) engine behind the book constantly updates and the online version as well as driving the data behind the printed version. No longer will you be looking at books that are out of date and obsolete as soon as they are printed. This product costs 65% less than its predecessor! Fully integrated with MPH(MyPartsHelp.com) so even the part pricing is automatically updated every time you look up a job rate. You have the ability to add your own job codes and customize the book based on your companies cost of doing business. You can order the national edition or your own custom printed books that are shipped directly to you. 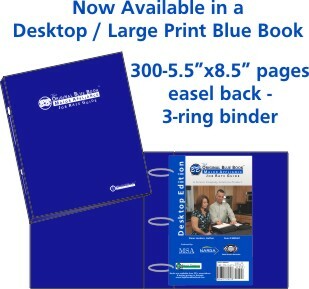 The Blue Book combines both the standard and premium appliances in one easy to use and understand book. Would you like more information on the Blue Book or on MyPartsHelp? Attend one of our free webinars. Webinar information is available here. The online product version of the "Blue Book" is currently in development. More information will be available soon.